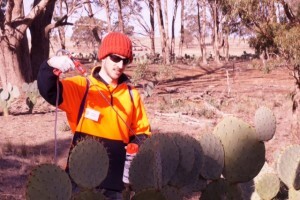 The aim of this project is to significantly reduce and control the Wheel Cactus (Opuntia robusta) infestation, a weed of National Significance, across the Network area. This will be done with a combination of community efforts, biological control and where possible directly funded stem injection of plants. 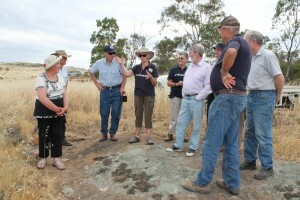 One site is Mt Buckrabanyule, a granitic outcrop that rises approximately 314m above sea level and is a significant local landmark amongst the surrounding flat agricultural landscape. That project area covers 1130 ha of predominantly freehold land. The Network has received funding from the State Government through the Communities for Nature grant round to undertake Community Working Bees targeting areas of Wheel Cactus at Mt Buckrabanyule. This project is run in conjunction with the Wychitella District Landcare Group and will include a number of working bees over the next 12 months to get work on the cactus infestation under way again. The grant will fund equipment purchase and working bee materials for the project. If you would like to participate in cactus stem injection (or learn the ropes) keep an eye out for the working bee notices or contact us. 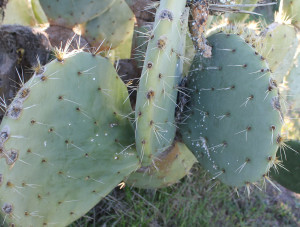 In January 2014 the Network with the Wychitella District Landcare Group obtained specimens of the Cochineal scale insect to release on the mountain. 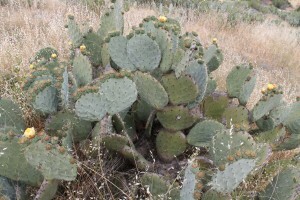 Previous use of the insect as a biological control agent in South Australia has seen a strong impact on the Wheel Cactus in terms of die off and slowed growth of plants. While not proven to take out large infestations, the small release site on Mt Buckrabanyule will add another dimension to tackling this weed. The progress of the insect will be tracked and if the population grows large enough, will be released to more sites on the mountain. With the high potential for spread into the surrounding landscape, the Loddon Plains Landcare Network Committee of Management see this project as of high importance, in order to reduce the potential impacts of this weed on native vegetation and agriculture in the local area. The Network will also be working with the Loddon Shire Council and other local agencies on a similar initiative for other Wheel Cactus outbreaks in the region. A Weed Control Committee has been established to ensure collaboration across multiple agencies in the efforts to target this weed and others.